Enhancing quality of life and contributing to a healthier future begins with safeguarding the safety and health of our people. To live up to our purpose internally, we want to help our employees make more informed decisions about their own health, take personal responsibility and choose to live and work in a safe and healthy way. We need our employees to be passionate about nutrition, health and wellness. By 2020: Offer our employees education, early screening and programmes that support healthier lifestyle choices. By 2020: Continue leading through industry forums. 97% of markets already offer health and wellness programmes to employees. To make our programmes more targeted, we are assessing the overall health profile of our employees through our Know Your Numbers Programme (KYNP). We have also articulated the minimum mandatory requirements in this area in the Employee Health Management Standard. This is not an exhaustive list of everything we need to do or work on, but sets high-level priorities for the Group that guide our planning. It is used as a reference by zones, globally managed/regionally managed businesses, markets and support functions, though they also take into account the specific context for their organisations. The table below shows key safety and health performance data for 2017. 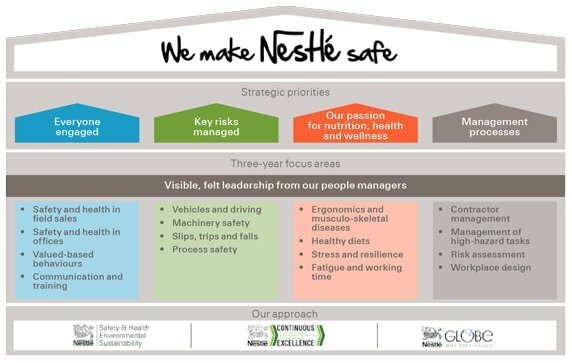 For more detailed information and safety and health data, please see the Nestlé GRI Index, 403–2. Total recordable illnesses rate for employees, on-site contractors and on-site members of public (per million hours worked). Recordable illnesses are those work-related illnesses that result in: medical treatment beyond first aid, restricted work, lost time or fatalities. 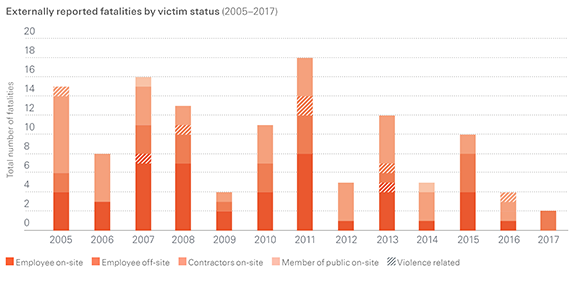 Injuries and illnesses are classified and reported according to a global Nestlé standard, which is based on the US OSHA record-keeping standard.